1. Preheat oven to 400 degrees F. Line baking sheet with parchment paper or lightly spray with non-stick cooking spray. 2. Whisk together flour, baking powder, baking soda, and salt in a large bowl. Add Greek yogurt and cheese; mix gently until well blended. Use a mixing technique similar to cutting in butter (keeping dough crumbly -- your goal isn't to make one big ball). 3. In a separate bowl, whisk egg into milk. Pour the milk mixture into the Greek yogurt mixture and use a rubber spatula to combine everything. Add a little more flour if dough seems too sticky. 4. Turn the dough out onto a floured surface and pat it out to about 3/4" thick. Cut 16 circles using a 2" biscuit cutter. If you are making "regular" biscuits you can just place the dough rounds on the prepared baking sheet, and 1.5" apart. If you want big biscuits, stack two rounds together (don't pinch together). Place them on the baking sheet about 2" apart. 5. 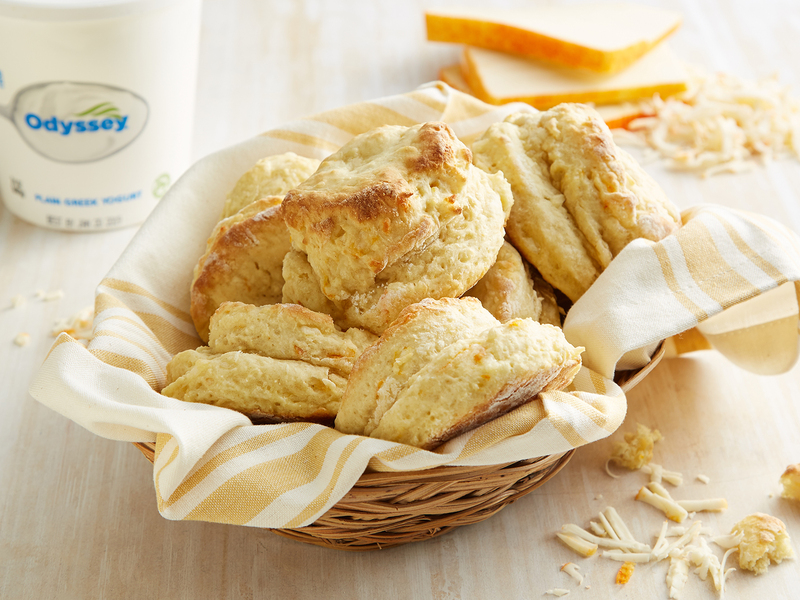 Brush the tops of the biscuits with the egg wash and bake for 10 minutes (regular size) or 12-14 minutes (double biscuits). 6. Serve warm, plain, or with butter and honey.